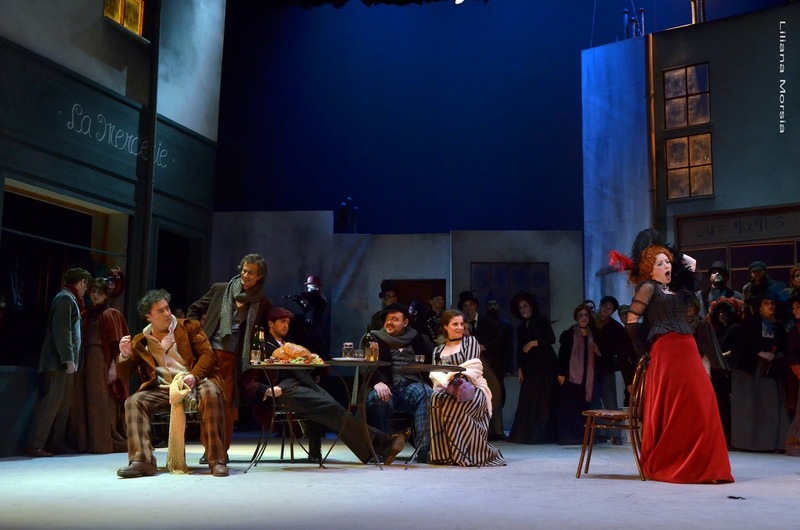 In the sweepstakes for first place in recent years, three operas hold the record of performances: Verdi´s "La Traviata", Bizet´s "Carmen" and Puccini´s "La Boheme". Curiously in all three the female protagonist dies, and in two (the first and the third) through tuberculosis. 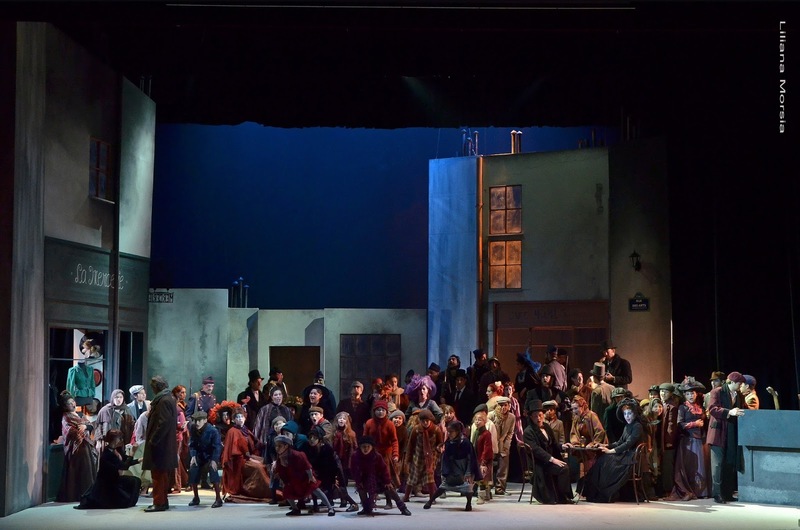 And in the same two, either the whole ("La Boheme") or most of the action happens in Paris. Furthermore, they are situated in the 1840s. Years ago I read a French edition of the novel that was the basis for Puccini´s opera: the charming "Scènes de la Vie de Bohème" written as a novel in 1843 (it also appeared as a "feuilleton" and a play, much as happened with Alexandre Dumas Fils´ "La Dame aux Camélias", basis for Verdi´s opera). This was a time of "femmes légères" and of free sexual relations with attractive but penniless artists. So they often alternated pleasure (or real love) with protection by aristocrats. The big difference between Mimì (Puccini) and Violetta (Verdi) is that the former falls in love with a writer and the latter with a young man from the high bourgeoisie of Southern France, but both philander with nobles when money runs out. True, Dumas Fils was more of a littérateur than the self-made and initially almost analphabet Murger, so his opus is more finished than the rather chaotic one by Murger, but in both cases there are autobiographical traits. And in both operas the librettists embellish the much harsher facts of the novel. Puccini came from "Manon Lescaut" ´s success (an opera with great similarities) when he tackled "La Boheme" with librettists Luigi Illica and Giuseppe Giacosa. Their libretto is full of witty phrases illustrated by the composer with unfailing appositeness. However, they have great failures which most reviewers don´t mention and should be. E.g., the matter of winter cold. All the First Act harps on it (the fire consumes Rodolfo´s drama) but when Mimì wants to accompany his instant lover to the Cafè Momus, Rodolfo tells her as in a famous jazz item "but baby, it´s cold outside"; although that could be a ploy to go to bed with her. But the Café Momus turns out to be a mostly open-air affair in which a vast crowd seems to be as comfortable as in Summer. Again the cold dominates in the Third and Fourth Acts, hardly more consistently (Rodolfo, a coward, wants to leave Mimì because she is very cold in his room, but she insists on staying outside in their meeting). As time goes by, the tomfoolery of the Bohemians becomes for me more irritating, for they act as teen agers, not full-grown men.And it´s very hard to find artists that are young and agile enough to make of the "fight" and dance something acceptable. However, Puccini´s wonderful music puts it all right: lovely melodies, endless imagination, refined orchestration carry the opera forward, even in its Kitchiest (the French say "chichi") moments. People don´t analyze, they just enjoy the beauty. 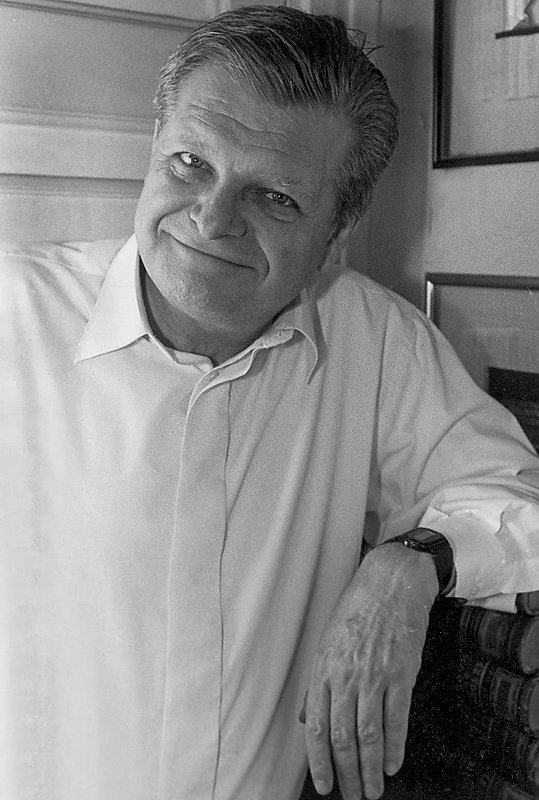 Thirty years ago when I mentioned the productions I made distinctions of quality, but the issue wasn´t whether or not they were given the proper ambience according to the time in which they occur. Now, as a symbol of what is going very wrong in the world of opera, I praise the very fact of respect to time and place. As I write, I tremble to think what La Fura dels Baus could make of "La Bohème". So kudos for Ana D´Anna (Juventus Lyrica, Avenida) as she gives us a reasonably good account of what the librettists wrote. And her human warmth (sometimes overdone) is what the piece needs. The fun of the children in the Cafè Momus scene was contagious. Her daughter María Jaunarena contributes beautiful and varied costumes of those times. The work of Gonzalo Córdova is much weaker: his sets are not absurd but they leave a lot to be desired, and his lighting was certainly very poor in the First Act, where there was too much light in the famous moment in which Mimì drops the key and Rodolfo finds it. When one says that the best thing was the conducting and the playing of the orchestra something is seriously amiss. The veteran maestro Antonio Russo (born 1934) keeps very well, strong and dynamic; his sensitive phrasing and very good contact with the singers and the choir (which he prepared) are those of a specialist. By the way, a good version with reduced orchestra was played (by Mario Parenti). The children´s choir came from various parts of the City within a social project called Musizap (Asociación de Amigos de Orquestas Infantiles y Juveniles). I don´t know what will happen with the second cast, but in the first Rodolfo was way below expectations. Although Mariano Spagnolo´s voice is stentoreous, he is musically bad, with poor intonation and a distempered timbre; as an actor his bulk doesn´t help. Sabrina Cirera, although a better musician, has too much vibrato and her timbre isn´t enticing. 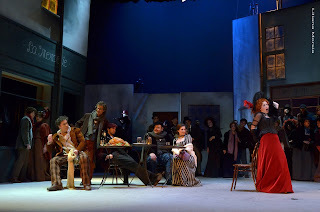 And Laura Polverini´s Musetta was too strident, even if she was in character. So the best contributions came from the other Bohemians: Fernando Grassi sang a true, fresh Marcello and moved well; Mario De Salvo was a good Colline, and Juan Font, a funny Schaunard. Gabriel Carasso (Alcindoro and Benoit) almost has no voice, so he resorted to effects; and Fernando Navarro was a rough Parpignol.